LED headlight bulbs and LED interior lighting because it’s kind of ridiculous that a 50k truck doesn’t have them from the factory. Also all weather mats. I’m ready for camping this weekend! Got some trade in offers for a new 4Runner, most dealers were offering way way way below what I was expecting for the BRZ. Took it to a shop that specializes in buying/selling sports cars and they gave me very very close to kbb value. As much as I love having a 400hp BRZ, I don’t need two sports cars. I’m starting the part out of the BRZ this week and will hopefully have it sold in the next couple months. Planning on getting a 2019 Voodoo Blue TRD Pro 4Runner to tow the Miata. Almost ready for track day! Waiting on my tuner to overlay the 93 and E85 dyno sheets for both 10 and 12psi, but holy crap this thing is scary now. I have no traction in first or second gear. I had to pass a car this morning and I went from 40 to 75 terrifyingly fast. I was giggling like a maniac the whole time. Banana Racecar is alive and well, got lots of goodies in the last couple months, but this is how it sits right now. My BRZ paint got delayed another week, and my rental is a Camry. 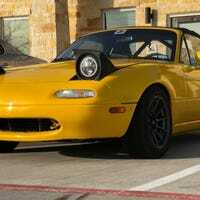 I’ve been driving my track Miata almost everywhere and there are ~30 days until my next track event. I’m having withdrawals. Post your track photos to help me get through the next month. Why am I so picky about paint? Impulse signed up for a track day in the Miata to force me to finish prepping it this weekend. I’m currently running OEM semi-metallic brakes/rotors that I replaced a couple months ago. They probably have ~1500 miles on them. Fluid is Motul RBF600. I’m gonna blame myself for this one. Wastegate bolt backed out and came loose, pressed up against the engine block and bent itself. Advan Racing RGD2 15x8 wheels and new front lip on the Miata! I had a small ducktail spoiler ordered but its backordered for 3 months so I cancelled that. Anyone have suggestions for a ducktail for the Miata, that doesn’t cover the 3rd brake light? Look at that strapping young idiot. That idiot decided that taking his turbo BRZ to a track day would be a good idea, even though it had a series of small problems. That idiot is me. Don’t be me.